The American jazz queen, Melody Gardot, is still eager to explore the world around her, but her focus has changed and been narrowed down to her own country. Her fourth album, Currency of Man, features social commentary on American society – a commentary wrapped in a bluesy analog sound with warm soul and gospel influences and lots of horns, a commentary that has never seemed to have more currency than now. 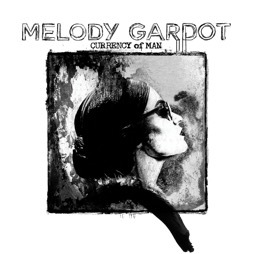 Melody Gardot’s life reads like a tale of resilience. After being hit by a car while cycling in 2003, Gardot suffered serious neurological injuries and even had to learn to speak again until music therapy helped her to cope with trauma, pain, and the hyper-sensitivity that still afflicts her today. She considers herself a citizen of the world, has been a traveler by choice and a musician by accident, and has always incorporated her personal experiences into her music. Her latest musical journey, however, doesn’t try to capture the exotic and lively places that she roamed for her last album, The Absence; rather, it seems to be the distillation of the dusty smoke, gray concrete, and sky-high electric wires in the cities of her home country. Commenting on the role of artists, Gardot says that it is “our job to put on our lenses and look at the world and see how that makes sense to us and how that makes sense to other people.” This is also Gardot’s approach to her latest album, Currency of Man. And especially lyrics-wise, the jazz singer has become less personal and more observational, for the first time exploring not only the ups and downs of love and heartache, but also social topics like poverty, economic crises, and racism in an expertly produced retro-sound and vibe. “See dat man sittin’ in front of the border line/ he ain’t got the time to argue what’s yours and what is mine/ See dat man holdin’ his hand out in desperation/ he don’t see salvation no god and sure no nation,” Gardot sings in “It Gonna Come,” displaying her powerful gift to paint lyrical pictures that sometimes are enhanced by the self-proclaimed “audiophiliac’s” passion for the incorporation of her own recorded soundscapes of cities, conversations, and cars (a real Porsche 911 engine on “After the Rain”). By teaming up again with the famous American musician, songwriter, record and soundtrack producer Larry Klein – who she already worked with on her second album, My One and Only Thrill, – Gardot has significantly changed her sound again. Gone seem the days of crystal-clear jazz production, South-American rhythms, and easy-listening strings. Instead, everything sounds like it’s wrapped in a warm and fuzzy coat of analog noise that reproduce an authentic sound of the 70s – an effect the songstress from Philadelphia achieved with the help of old school production techniques and microphones to fit her lyrics and create an authentic retro charm. The combination of sound and lyrics feel like a time warp that transports serious themes from critical times in America’s past into the present where they strike a contemporary chord. In “Preacherman,” a song based on the story of Emmett Till – an African-American teenager who was brutally murdered in 1965 after reportedly flirting with a white woman – those efforts culminate with the help of a gospel choir and even distorted guitars. As always with Gardot’s music, the results sound soothing and subtle to the ears most of the time. However, this time there is a lot of brooding potential under the surface, especially in the songstress’ voice as it oscillates between lamenting and crooning over slick bass lines and colorful brass sections. These seem to form the new centerpiece of her newly found sound, sometimes nearly overshadowing the smooth production. Songs like “Same to You” or “She Don’t Know” showcase the new direction of the jazz singer’s most extroverted work to date. On the last third of the album, Gardot steps back sound-wise and thematically into the more familiar territory of My One and Only Thrill, the album that made her the star of today’s jazz scene. And although “Morning Sun” could have found its place on one of the many musical outpourings of Norah Jones, Gardot’s voice and expressions always add the necessary substance and seriousness to her songs that turn the lush and sensual “Once I Was Loved” into five minutes of pure auditory ecstasy as if it was meant to be the salve for Gardot’s own wounds. Inspired by Franz Kafka’s famous quote about literature, Larry Klein sums up Gardot’s new musical journey: “Music is the axe for the frozen sea within us.” And never has an axe sounded more pacifying! Benedikt Fleischer studied Business Psychology and Cultural Studies with an emphasis on auditive culture at Leuphana University in Lüneburg, Germany. He is singer and songwriter in the band Access : Icarus.